Proprioception as Primary Thought Function. Proprioceptive “frequency-resonance” sensation. This is my primary cognitive function. Secondary visuospatial “Chladnic-construct” representations of proprioceptive sensation. All thought within me begins as a physical proprioceptive sensation in the major skeletal muscles in my torso, arms and legs, which are experienced as a frequency-resonance that buzzes, crawls, hums and thrums within and throughout my flesh. The same intramuscular sensations that you unconsciously use to coordinate your body parts in three-dimensional space relative to each other and the immediate environment, I am dependent on to perform all cognitive functions, from simple to advanced. Every concept-thought has a unique frequency-resonance “signature” that identifies it. Combinations of concept-thoughts, such as has to occur with sentences, paragraphs or larger chunks of cognitive content like sections, result in the sum frequency-resonance of each combination-cluster. As an example, the frequency-resonance signature of Paragraph A represents the sum frequency-resonance of all the sentences comprising it. Each sentence within Paragraph A has its own unique frequency-resonance as well, as does every individual word in those sentences. The proprioceptive frequency-resonance sensation is experienced concurrently with the manifestation of visual representations in my brain+mind. Just as every concept-thought has a unique proprioceptive frequency-resonance signature, so does it have a unique three-dimensional, grayscale “object” form that is manifested within my brain+mind, in what I call the Construct. The Construct is the “loading program” of my brain+mind, so named after the Construct in the film The Matrix. The Construct in my mind is an infinite high-dimensional space with no walls, bounds or limits. The environment is perfect pitch black (in contrast to that in the Matrix) and is comfortably cool in temperature, I’d say around 20-25°C. It is also perfectly silent, like being in a top-notch soundproofed and acoustically treated recording studio. Objects visualised in the Construct are similar to Chladni sand configurations in that they, too, are comprised of particulates and can vary in particulate density. However, where Chladni sand configurations are two-dimensional geometric patterns sitting on a metal plate, objects in my Construct are three-dimensional amorphous forms, varying in shape and size, suspended in three-dimensional space of the Construct. I can not only pan, tilt and zoom in on and away from any object visualised within the Construct, I can also move freely around objects. However, I never perceive myself in the Construct. No body, no manifestation of any visual form. In the Construct, I am simultaneous consciousness perceiving consciousness creating. Writing as a Practical Demonstration. So, putting it all together—How does all that work in real life? Let’s use my writing this article as an example. So, I’ve had the idea to write about my cognitive experience for a couple of years now. This proprioceptive frequency-resonance experience simultaneously manifests as a three-dimensional amorphous greyscale particulate object in the Construct of my brain+mind. So I can see and feel—experience—the entirety of the idea for the article in an instant. However, if I want to communicate this idea, I will need to parse the wholistic-instantaneity of proprioceptive thought native to my brain+mind and body into the sequential-linear format required for translation into language. The very thought initiates the “parsing” proprioceptive frequency-resonance that “loads” in my Construct, not as an object, but as an event. The “parsing” frequency-resonance “vibrates” through the article-object and splits its mass into a collection of smaller, individual “child”-objects and rearranges them into a three-dimensional mind map suspended in the black space of my Construct, where nodes branch into clusters of “child”-objects. This takes place in an instant. There is no perceivable transition. Each individual “child”-object represents a distinct concept-thought unit-constituent of the article. A single “child”-object may be concrete (a word or sentence) or abstract (a representation of an overarching “mood” or “emotion” or “tone” that is supposed to infuse a particular section of the article). 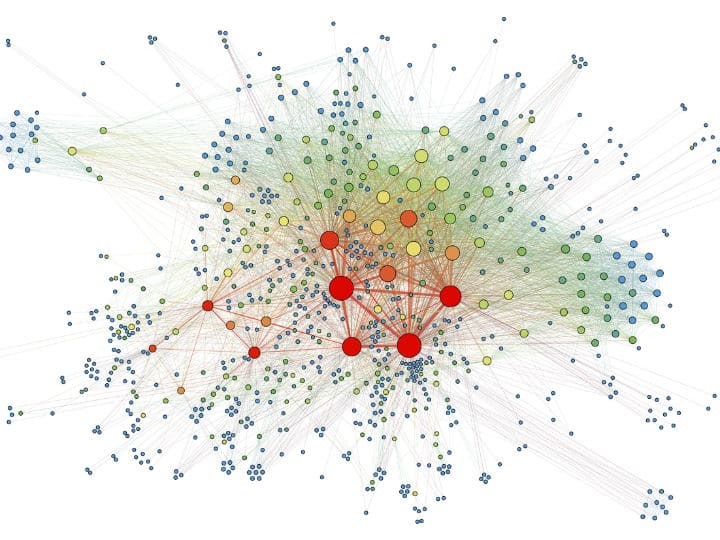 Each cluster represents a collection of highly related concept-thought unit-constituents. Usually, clusters end up being either sentences, paragraphs or whole sections of an article, depending on its size and position within the overall mind map or within a larger “mother”-cluster. Relevance and relationship between “child”-objects and clusters are represented by relative positioning to one another within the mind map. Distance and proximity represent low and high concept-thought relevance. Concept-thoughts of high thematic and logical relevance clump into clusters, whereas low relevance is represented by the space and distance between clusters. Angular relationships represent logical relationship between “child”-objects and/or clusters. This particular aspect is especially difficult to articulate. Crudely put, the angle between “child”-objects and/or clusters tells me how each entity is related to one another, as well as where each “belongs” in sequential-linear positioning. Sound Check, Testing, Testing, 1, 2, 3. The first, raw and automatically generated “draft” version of the mind map is far from perfect, however. All “first draft” generated idea-as-object-mind-maps contain “search results” by broadest possible relevance to the desired objective and content of an article. Depending on how specific and how clearly defined an idea is originally formed in my brain+mind—as well as desired or required word count or objective/content specificity—and not to mention how ideas tend to morph as you work on them, I sometimes end up paring or completely changing up to 50% of all original data invoked in order to create a precise piece of writing. Inter-object, as well as inter- and intra-cluster, relationships for logical fidelity. As already mentioned, each object and cluster has its own unique proprioceptive frequency-resonance signature. This frequency-resonance can be felt, seen… and heard. I use the auditory modality primarily for enhancing relevance and relationship analysis. Not independent of proprioception—I can’t—but as an additional support function. A crude analogy is that of tuning a musical instrument. Close to perfect “match” in frequency-resonance of two objects indicates high relevance. Tonal difference gives an indication of logical positioning. Low relevance and poor logical relationships result in a mismatching harmonic-sensation that is jarring, grating and displeasing to experience. High relevance and sound logical relationships result in a sum harmonic-sensation that is pleasing to the brain+mind and body. Spatial 3D to Linear 2D Conversion. The final step is to painstakingly convert and translate the polished three-dimensional representation of my article into a sequential-linear format and assign accurate language to articulate each basic concept-thought unit with proper grammatical syntax. Usually, the sequential-linear conversion process is not too bad. The frequency-resonance relationships tell me “where” and “how” each cluster—and its constituent sub-clusters—are to be organised, although that does change depending on how I choose to reorganise and rewrite as I go along. It is the language assignment process that pains me the most, and is the most frustrating and time consuming. Translation = Language Assignment = Ouch. As an autistic person, and I suspect synesthetic as well, words are “defined” by their frequency-resonance, not by the dictionary. As I mentioned, language is not my first language. I suffer from the same frustrations that all polyglots do. Specifically when they encounter words and phrases in language X that simply lack the nuanced complexity found in language Y.
Sequential-linear language is so lacking in nuance, detail, complexity and intensity that it drives me insane. Plus definitions are so confusing. Take for example my sentence above. I would have written “subtle nuance” if I could have gotten away with it. However, that’s redundancy because, according to the dictionary, “nuance” is already “subtle”. Bah! To me, however, “subtlety” and “nuance” do mean two completely different things, in ways I cannot articulate. Compounding the two is important. The texture is different. Therefore, the meaning is different. Not in the English speaking world, unfortunately. The language assignment process is a lot of back and forth, especially in the last stage of publishing. I zip between WordPress and the dictionary or thesaurus almost every sixty seconds. Each concept-thought object or cluster must be frequency-matched to its closest corresponding English word. Then I must select and create the most appropriate grammatical syntax to articulate and convey what I mean in the most precise and concise way possible. Verbosity is my guilty pleasure, brevity an enforced diet. Writing is not just an art form—It is a discipline, a martial art. Ultimately, final product, be it an article or script for a YouTube video, must generate a sum harmonic that is pleasurable to experience. Otherwise, I know what I’m creating, or have created, is flawed. Freeze-Framing Proprioceptive Thought is Not Practical or Accurate. The real process is not as simplistic, or as orderly, as I describe above. There are some things that sequential-linear language will never be able to capture, much less articulate accurately. I actually jump between all of the above “steps” so often and quickly. Most times I do everything in a single, simultaneous instant. I was forced to slow my cognitive processes down to a micro-fraction of the speed they normally occur. Just so I can accurately observe, analyse and identify each stage of the process in order to write this article. It was an educational, and even entertaining, experience, as I got to look up concepts like cymatics and high dimensional space, and even discover this awesome cymatics-inspired music video! In closing, I would like to invite you to think about and share your own unique cognitive processes as a gifted person in the comments below.